Habib Rafiq (pvt) Limited is a well-known name in the industry of housing and construction with an illustrious history spanning over 7 decades. Realtors and investors across Pakistan have witness the quality of development in DHA and Bahria Town projects, where major development work has been done by HRL. The developer has deployed the best of its professional expertise and resources in planning and development of this first ever smart city housing project in Pakistan. Capital Smart City is an approved housing project and it has obtained initial NOC from RDA. 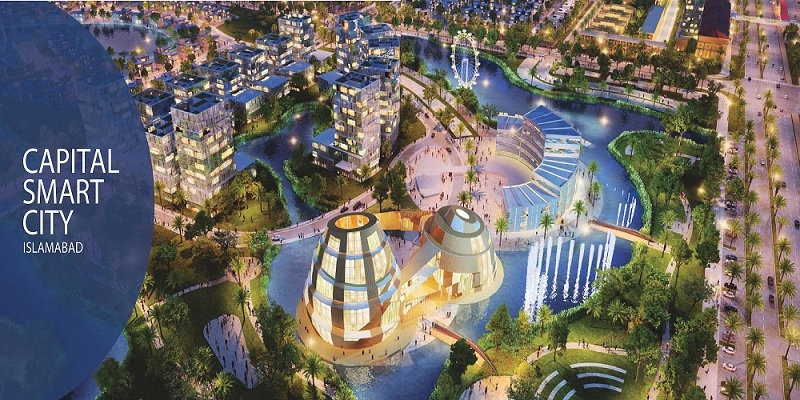 The society is planned over an area of 45000 kanals of land, while ample area has been marked for future extensions in order to materialize the concept of a smart city. Initially, the development work has started over an area of 25000 kanals that will keep expanding over time. The developer has already acquired more than 80% of the total required land, while more land is being purchased for future extensions. Capital Smart City is planned to be an eco-friendly housing project that will provide excellent residential and business opportunities to its residents. Special attention has been given to the preservation of natural environment of this beautifully undulating terrain, therefore a large area has been left open for parks and plantation. HRL has planned this smart city on the principles of self-sustainability keeping in view the projected influx of population in Rawalpindi & Islamabad over time. Capital Smart City is ideally located close to Thalian Interchange at about 9.2 KM distance from Motorway M-2 Toll Plaza. It falls in Mouza Chahan and Mouza Mandwal with a large area facing the motorway. It has got easy access through chakri road, moreover its dedicated interchange from motorway has also been approved by FWO. New Islamabad International Airport, coupled with CPEC western route, is going to shape the future of developments in Islamabad. Therefore, the location of Capital Smart City is of vital importance. Once the connectivity issue is resolved, major shift of population and businesses will be towards this newly developing zone along the motorway. Direct access through Motorway M-2 Interchange will make it much easier for the residents to travel towards Islamabad City or New Islamabad Airport. Close-by housing schemes include Al-Haram City, CBR Town Phase 2, PIA Enclave, Bin Alam City, Blue World City and FGEHF Thalian Housing Scheme. Dozens of new housing projects have already emerged over the past few years, but hardly any society is comparable with the concept and standards of Capital Smart City. 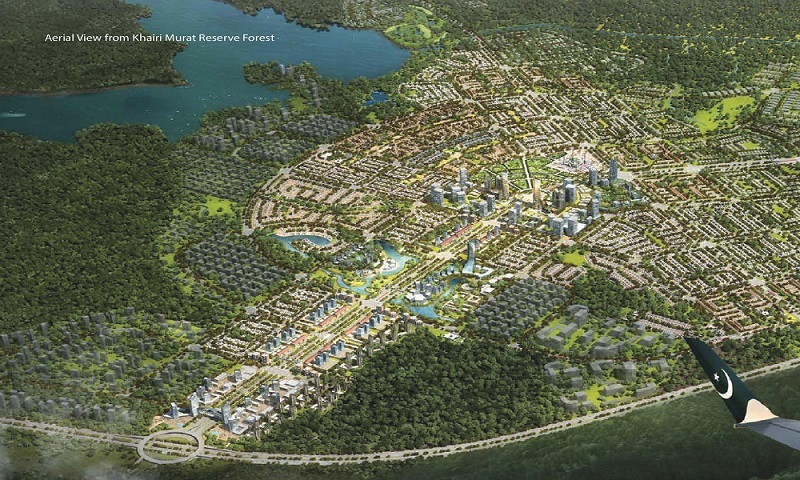 Capital Smart City’s master plan is meticulously designed by a Singaporean government-owned urban planner “Surbana Jurong“; which is renowned for designing smart cities across the World. The consulting companies include Future Developments Holdings Pvt. Ltd. and Engineering Dimensions Ltd.
As you can see on the master plan map given above, there are several blocks dedicated for different sizes of residential plots, commercial plots, and farm houses. You may also notice that it is getting direct access through Motorway as well as proposed Rawalpindi Ring Road. 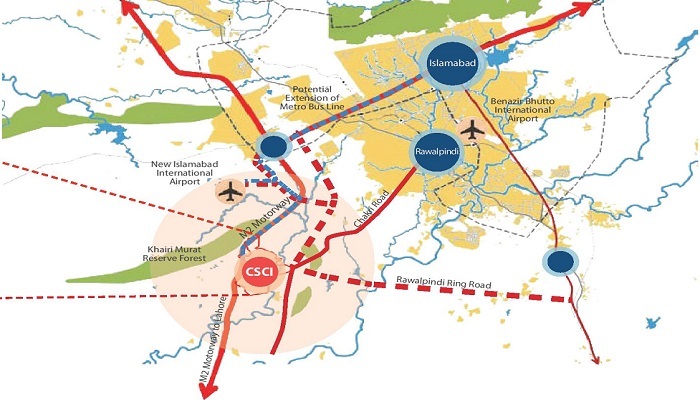 This dual access implies that the residents of Capital Smart City will be connected to Islamabad, Rawalpindi, New Islamabad Airport as well as Lahore and Peshawar through major road networks. Each block is planned is such a smart way that it has its own commercial market, park and Masjid. There is a large area reserved for future extensions of the project that will be planned over time with development progress. Central Boulevard of the society will be 350 feet wide and it will have 14 lanes. Internal roads will be 150 ft, 120 feet, 100 feet, 80 feet and 60 feet wide. Streets will be minimum 40 feet wide. All roads and streets are well integrated in a systematic way,so that traffic flow will be uninterrupted. The society will implement an integrated IT infrastructure to record and maintain an online database of activities within the community. Whether it be the schedule of public transport, or the schedule of events at the community club, the society will maintain up-to-date online record of all activities. Capital Smart City is the first ever housing scheme in Pakistan to offer smart city facilities. Most of the services have been automated which include automated environmental collection, automated utilities supply, load shedding free environment, air conditioning control systems, CCTV with facial and object recognition, free WiFi zones, automated traffic control and much more. 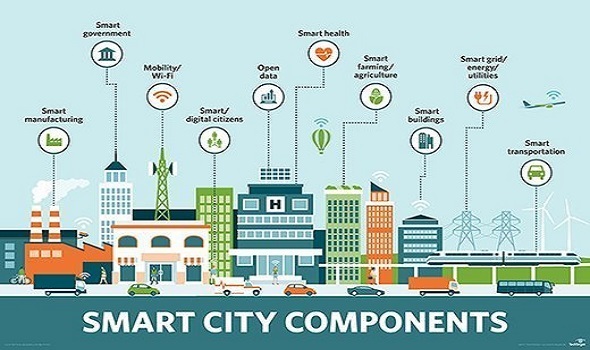 Capital Smart City has begun to attract major investors and institutions, and a few have inked agreements with the company to open up their businesses and campuses in the society. Recently Mövenpick Hotels & Resorts has signed agreement with the society to open up a grand hotel that will be completed by 2023. Similarly, Harradine Golf has been given the task to design an 18 hole golf course at the society. A major breakthrough was observed when National Defence University (NDU) inked agreement with HRL to open up an international university campus at Capital Smart City. Development work on the project has already been initiated by HRL. Much of the earthwork has already been done, and a large number of vehicles are actively working to achieve the given development milestones. If you look at the development progress, you might not be surprised to know that possessions are promised to be handed over by 2021. Overseas block will be the first to be developed and handed over, while native blocks and farm houses will follow soon thereafter. Capital Smart City Islamabad offers a variety of options including residential plots, commercial plots, luxury villas and farm houses. Currently the society is offering 5 marla, 7 marla, 10 marla, 12 marla, 1 kanal and 2 kanal residential plots; 4 marla and 8 marla commercial plots; and 5 kanal and 10 kanal farm houses on 3 years flexible installment plan. The prices are comparatively a bit higher than adjacent housing schemes, however the planned features and the big name of HRL fairly justify the reason behind higher prices. Please note that commercial plots are no longer available on fresh booking. If you want to buy a commercial plot, you will need to pay some profit along with 20% down payment. Please note that residential and commercial plot prices are exclusive of development charges, while farm house prices are inclusive of all development charges. 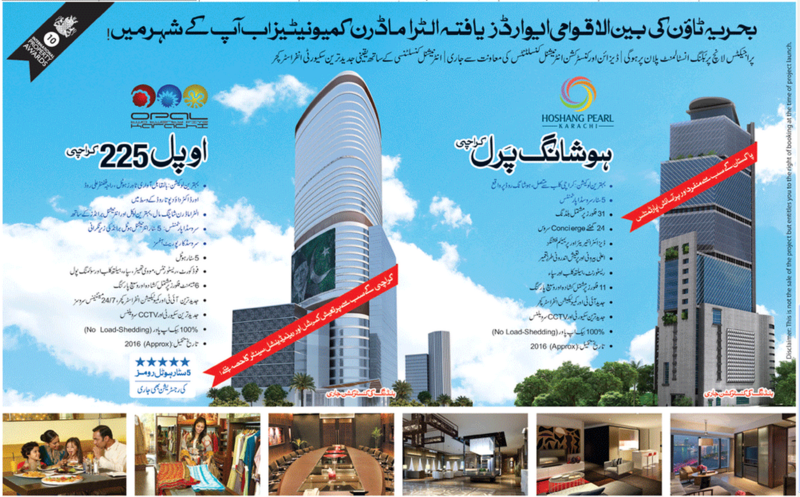 Estimated development charges are 1 lac per marla for residential plots and 5 lacs per marla for commercial plots. 10% discount is applicable if you pay full amount at the time of booking, and 5% discount is applicable if you pay 50% amount. There are very limited options available for booking, so you should make your decision fast if you want to avail this opportunity. Pay order of 10% down payment in favor of “Future Developments Holdings (Pvt) Ltd. Submit your form, documents and pay order to us to confirm your booking. Your file will be ready within 30 days and dispatched to your address. 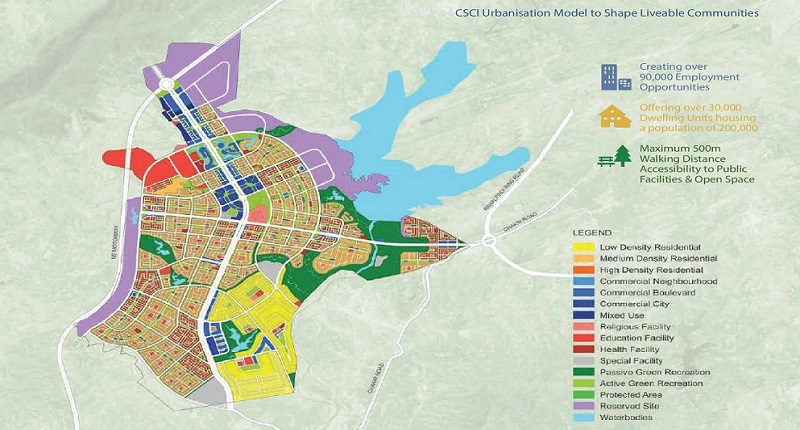 If you need any further details on Capital Smart City, its development plans, exclusive features or you want to visit the site and book your plot, feel free to contact us via email at marketing@manahilestate.com or call us at 0333-5180001 or 0345-5222253.